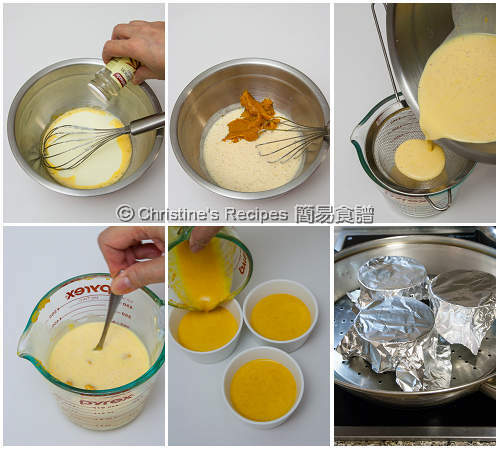 What about the egg yolks after I used the egg whites to make the steamed ginger milk custard? I didn’t waste them. 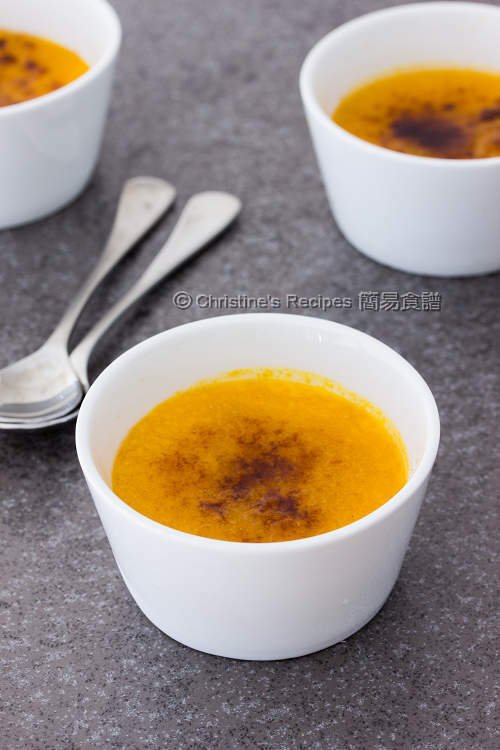 I made pumpkin crème brulee at the same time, then refrigerated them to be enjoyed the next day. Pumpkin is known as a super food, very nuturious, extremely high in fiber and low in calories. Thus, I cook pumpkin for my family quite often, not just on Thanksgiving day. 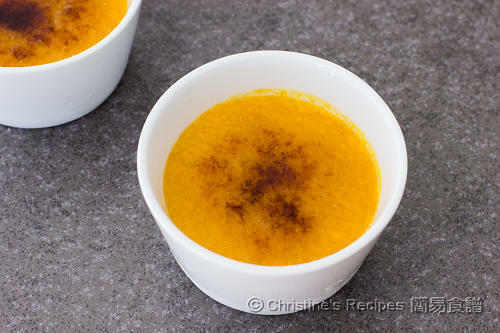 The traditional way of making crème brulee is “hot water bath” in an oven. In order to shorten the cooking time, I detoured and steamed the custard. Believe it or not, the family couldn’t tell the smooth and creamy custard was not from our oven compared to those I baked before. Peel and dice the pumpkin. Cook in a microwave oven or a wok until softened. Press through a sieve and make a paste. Measure out the quantity the recipe called for. Set aside. 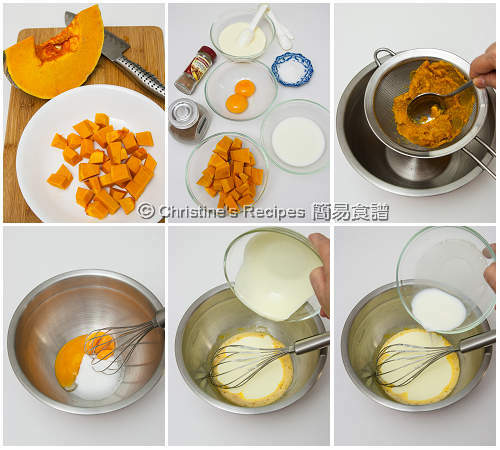 In a large mixing bowl, combine the egg yolks, sugar, cream, milk, nutmeg and pumpkin puree. Drain through a sieve and evenly pour into the ramekins. Cover each ramekin with foil and steam in a wok over medium high heat for 15 minutes. Turn off the heat. Don’t remove the wok lid. Let it rest for 15 minutes. Carefully remove the ramekins from wok and let them cool completely. Transfer into fridge with foil covered for overnight. Remove the ramekins from fridge. Generously sprinkle raw sugar on the surface of custard. 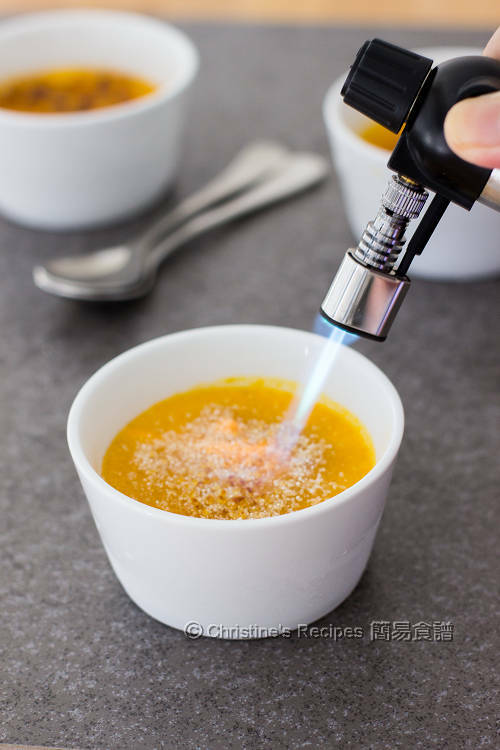 Caramelize the sugar with a kitchen torch to your liking. Enjoy ! I love the fragrance of raw sugar. You can replace it with white sugar if you don’t have any in hands. If you enjoy a bit of texture of pumpkin in the custard, feel free to skip the step of pressing through a sieve. The thickened cream I used contains a little amount of galetin. You might use whipping cream though. If using whipping cream, you might like to add one more egg yolk to get a firmer texture. The sweetness of different kinds of pumpkin is not the same. Feel free to adjust the amount of sugar to your liking. Steamed creme brulee...how unique and I am very sure they are delicious as well. Oh, this is something different, steamed instead of baked. Thanks for sharing! sounds delicious, but what if I don't have a kitchen torch? Any suggestions? The only way to caramelize the custard I can think of is to use an oven and broil it. Does it sounds funny ? try carrots instead of pumpkin or eggplants.